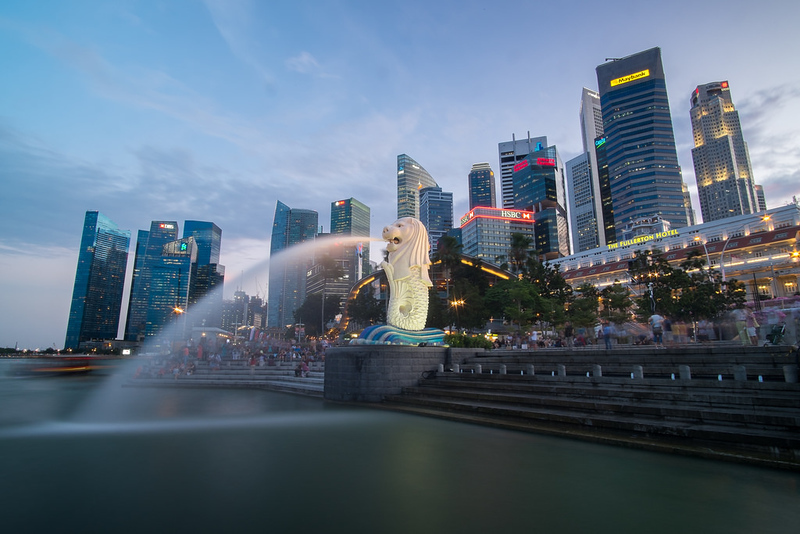 A two day Singapore itinerary lets you see all of the city-state’s bustling shopping districts and modern marvels and enjoy the leisurely, tropical side of Singapore. Our two days in Singapore itinerary takes a detour from the central city sightseeing with a day trip to Sentosa Island — Singapore’s exciting island resort destination that’s home to beaches, theme parks, golf courses and more. You can find our full day two Singapore itinerary below. 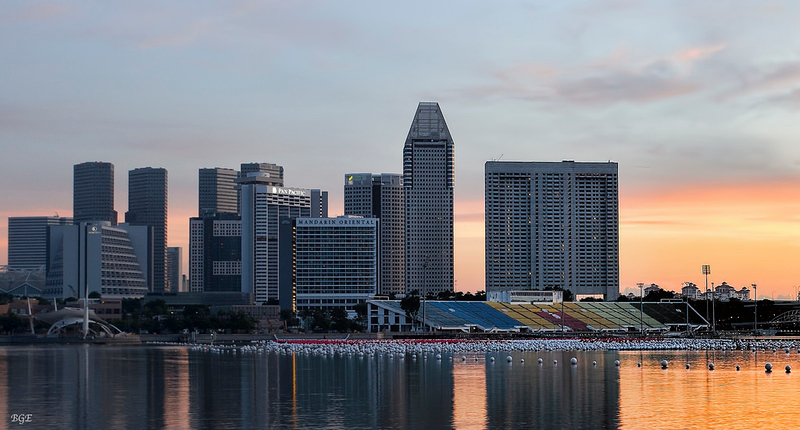 To plan your first day, use our One Day in Singapore: Must See Itinerary, which covers the shopping districts, attractions and highlights of central Singapore. Our second day in Singapore focuses on the attractions you can find outside the central city, beginning with a trip to Sentosa Island. Home to theme parks, resorts and one of Singapore’s best beaches, Sentosa Island is the perfect place to spend a warm, sunny morning. In fact, there’s more than enough to do on Sentosa Island to keep you occupied for the entire day. There are several ways to get to Sentosa Island, ranging from the Sentosa Express monorail line to taxis. 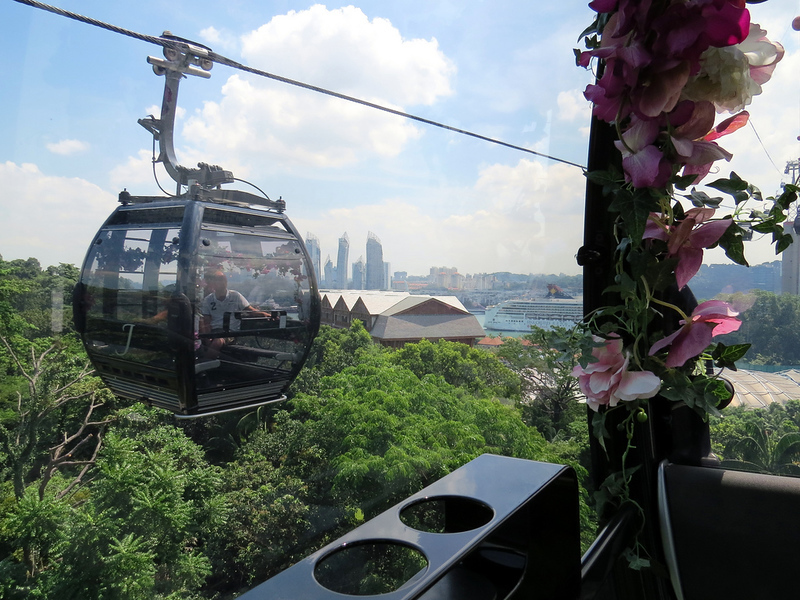 The most exciting way to reach the island is using the Singapore Cable Car, which provides a great view of the island as it travels across from the “mainland”. The cable car departs from Faber Peak, with a stop at Harbourfront Tower II on the way to the island. If you’re coming from the centre of Singapore, the easiest way to catch the cable car is by taking the MRT to Harbourfront, then using the cable car station in Harbourfront Tower II. As of 2017, return tickets for the cable car are $33 SGD for adults and $22 for children, with access to Sentosa Island included. You can add a return trip for an extra $5, making it cheap and easy to travel back from Sentosa Island at the end of the day. If you prefer to get to Sentosa Island by train, you can access the island using the Sentosa Express monorail from the third floor of Vivocity shopping mall, which is located right beside Harbourfront MRT station. Sentosa Island is Singapore’s premier resort and recreation area, with everything from pristine tropical beaches to a Universal Studios theme park. Transport on Sentosa Island is free, making it easy to get around the island and hop from one activity to another. 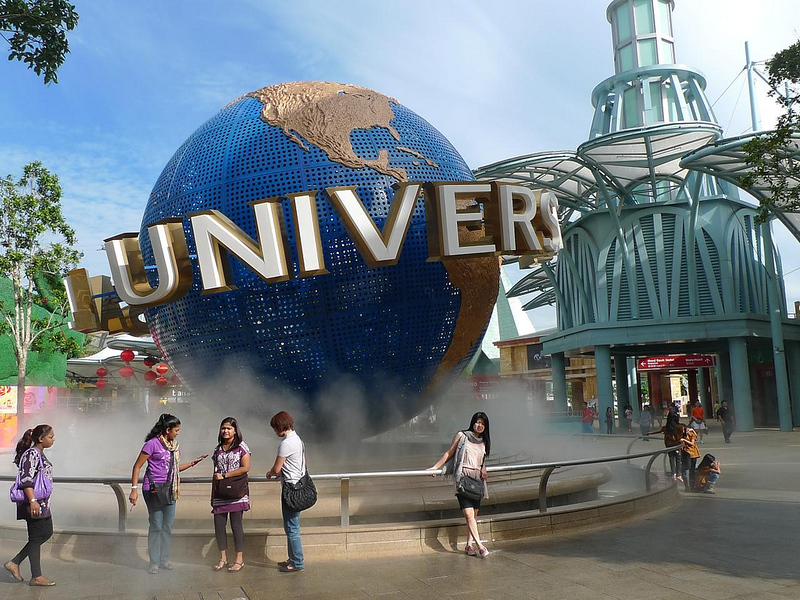 If you’re travelling with children or teenagers, a trip to Universal Studios Singapore is a great way to spend the day on Sentosa Island. Open since 2010, Universal Studios Singapore is a modern theme park with the usual selection of movie-inspired rides and shows. Park highlights include Jurassic Park, Battlestar Galactica and Revenge of the Mummy. There are also a great selection of live and 3D shows aimed at children, ranging from Shrek 4-D and Puss in Boots to Madagascar and Sesame Street. Officially the world’s largest aquarium, S.E.A. 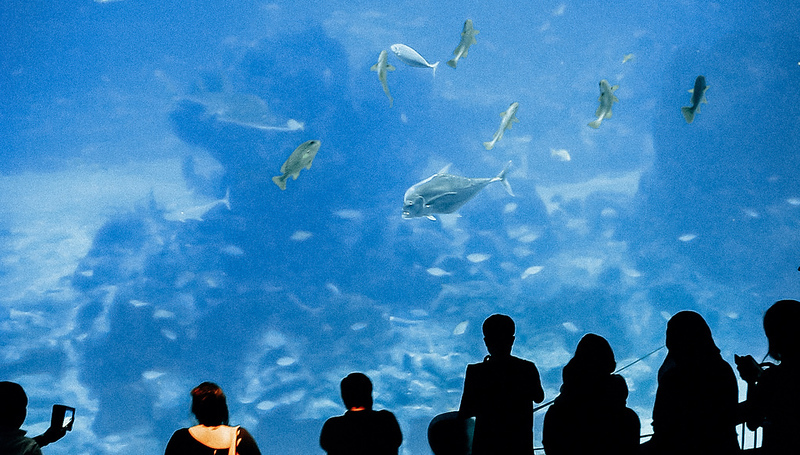 Aquarium features 49 different habitats, 800 forms of marine life and more than 100,000 marine animals. The aquarium is divided into 10 different zones, letting you observe marine animals from a variety of areas of the world’s oceans. Highlights of S.E.A. Aquarium include the gigantic Open Ocean habitat, which offers an amazing view of marine life in a completely open habitat, and the Shark Seas tank, which contains more than 200 sharks, including several endangered species. If you’re visiting Sentosa Island with children and feel like a quieter experience than Universal Studios, S.E.A. is definitely worth a visit. The Fort Siloso Skywalk is an 11-storey elevated walkway leading to Fort Siloso — a restored gun battery that was designed to defend Singapore from an invasion by sea. The walkway is free to enter and offers beautiful views of Sentosa Island’s beaches from above the treetops. Fort Siloso itself is an interesting historical attraction that’s definitely worth a visit, especially for military history enthusiasts. Built in 1874, the fort was fitted with heavy armaments before the Second World War to serve as protection against a sea invasion of Singapore. 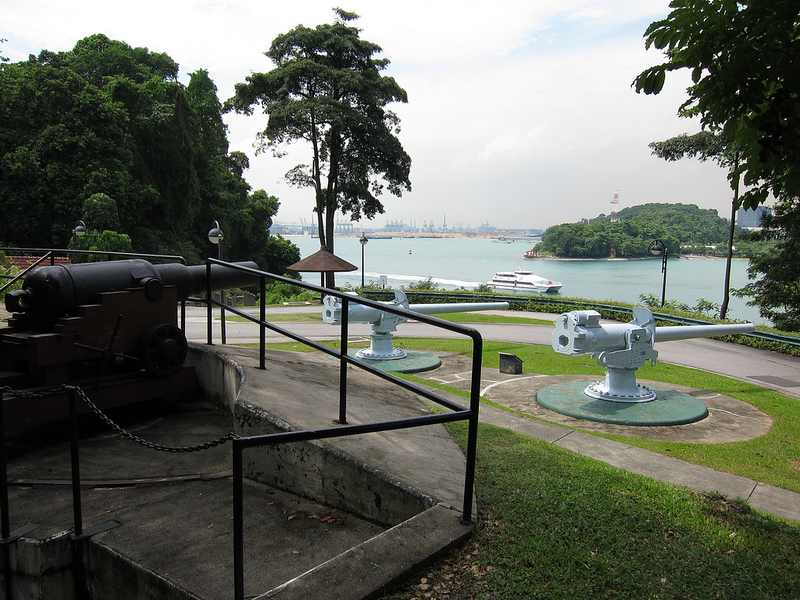 When the Japanese invaded Singapore by land in 1942, the guns in the fort were turned inland as part of the defence against the Japanese position. After the invasion, the fort was used as a prisoner-of-war camp until the Japanese surrender in 1945. Today, the fort contains a museum documenting Singapore’s period under occupation, as well as the early and World War II history of the fort itself. 131 metres above the ground, the revolving observation deck of Tiger Sky Tower offers a great view of Sentosa Island and Singapore’s central city. The trip up and back down takes about 15 minutes, giving you plenty of time to appreciate the view. One of two casinos in Singapore, Resorts World Sentosa offers the usual selection of slots and table games, most of which have fairly high minimum bets. Entry is free for non-Singaporeans and $100 SGD for locals. Another good option if you’re visiting Sentosa Island with young children, Madame Tussauds has wax models of all of the celebrities, historical figures and world leaders you’d expect, with several Singaporean, Chinese and other Asian celebrities for local visitors. Perfect for children, Skyline Luge offers a fun ride down a safe, moderate-speed track complete with hairpin corners and long straights. The luge course is split into four tracks, each offering a different level of speed and excitement. There are three beaches on Sentosa Island, all of which are great for sunbathing, relaxing and swimming. Siloso is the most heavily developed of the beaches, with a variety of restaurants and bars, while Palawan and Tanjong offer quieter, more family-friendly environments. While the beaches on Sentosa Island are as spotlessly clean as you’d expect for Singapore, the water is on the murky side and not particularly good for snorkelling. Surprisingly, the crowds on most of the beaches are usually pretty light, with the exception of sunny public holidays. Most of the dining options on Sentosa Island are high-end restaurants and chains, although you can also find local Singaporean food if you look for it. Dining on Sentosa Island means you can stay around and catch a show after dinner, before heading back into the city. Malaysian Food Street. This hawker food street is a great place to enjoy Malaysian food at reasonable prices. Expect to pay about 30% more than you would in the city here, but still less than at most chains. The Knolls. Located inside the Capella Hotel, The Knolls is an upmarket restaurant serving Western brunch, lunch and dinner. A great place to enjoy steak, fresh seafood and a good glass of wine with a view over the hotel grounds. Joel Robuchon Restaurant. As Singapore’s only three star Michelin restaurant, Joel Robuchon Restaurant is the place to go on Sentosa Island for truly exquisite high-end dining, with prices to match. Trapizza. This Italian restaurant on Siloso Beach offers a great view of the water and a relaxing ambiance. Prices here are on the high side, although the quality of the food is also very high. A great option for a romantic dinner right on the beach. 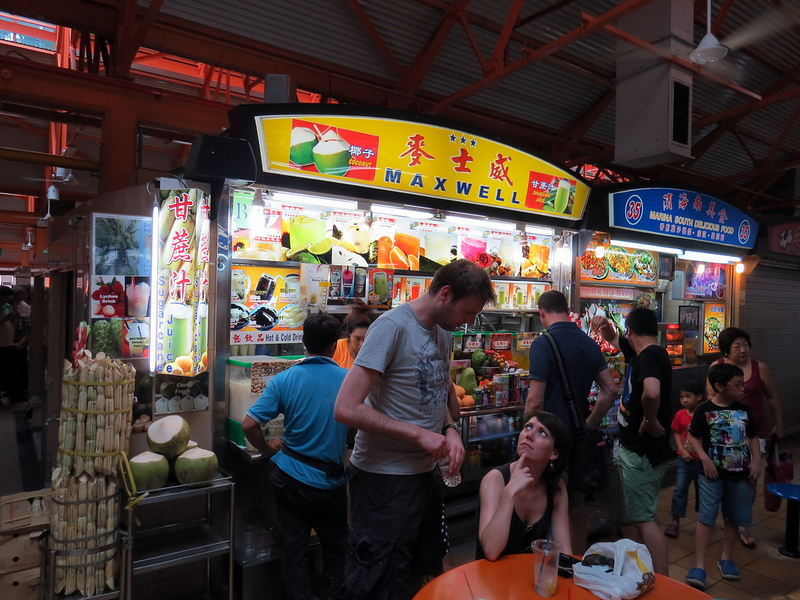 Maxwell Road Hawker Centre is one of Singapore’s most famous hawker centres, with a diverse selection of stalls selling everything from fried rice and noodles to curries, fresh seafood, porridge, desserts and more. Smith Street is another great budget dining option located in the heart of Chinatown, close to most of Singapore’s budget accommodation. Haven’t booked your Singapore hotel yet? Although staying on Sentosa Island puts you close to Universal Studios and other attractions, it isn’t a very convenient location for seeing the rest of Singapore.